Kati Toivanen's 'Petticoat on Petticoat Lane,' at 11th and Walnut, is a whimsical nod to Kansas City's garment district. If you’ve driven through downtown Kansas City recently, you’ve probably seen the orange cones from the streetcar construction. But what about that blue petticoat at the top of a street sign, or the brightly colored quilts wrapped around bus shelters? Art installations and performances return this summer to Kansas City's downtown loop. The nonprofit Art in the Loop was founded in 2004 to commission public art for downtown. But last year marked a pilot project to expand programming to poetry, music, and performance art for downtown employees, residents, and visitors. Jessica Borusky, an artist and adjunct art instructor at UMKC, returns this year as curator and says the artists are taking a thoughtful approach. "(It's) not what's called plop art or plunk art, so (it's) not I have this thing and I'm going to put it there, and there it is. But rather, responding to downtown," says Borusky. In office buildings near the park at 12th and Walnut, construction is a theme —from an installation of tools of the trade to photographs of workers bringing the streetcar to life. At a bus stop at 10th and Main, a dancer and a sound designer teamed up for a performance. Photographer Dan Frueh has documented this stretch of sidewalk for the last decade. And there are artists who are a little more whimsical. 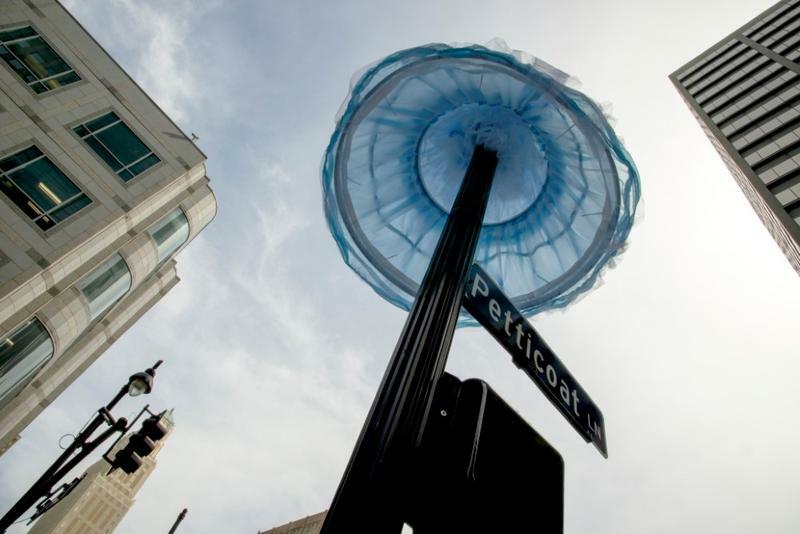 Kati Toivanen, professor of digital imaging at the University of Missouri-Kansas City, encourages you to look up at a flouncy blue petticoat at 11th and Walnut, a nod to the area's history as a garment district. 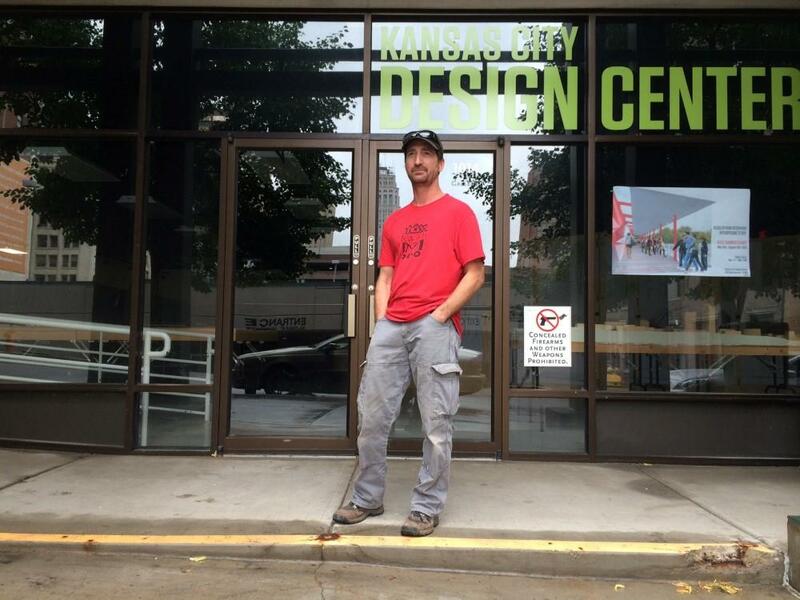 Photographer Dan Frueh wants you to look down at the sidewalks near 11th and Main. "I'm seeing the marking of all the utility guys that come by and mark what's underneath the sidewalk," he describes, walking as he looks down at the lines and symbols on a recent weekday. "I'm always looking at that stuff, because it's a language all its own." Frueh moved to Kansas City in the early 1990s, and graduated in 1994 from the Kansas City Art Institute. He now runs the Trap Gallery in Columbus Park. For twenty years, he's taken photos of rust and pavement, like this stretch of sidewalk. "You can see that there used to be a fence that was stuck in the sidewalk there. And they just came and cut off the fence post, right at the concrete level, so there's this series of rusty circles that kind of work their way down the sidewalk," he says. 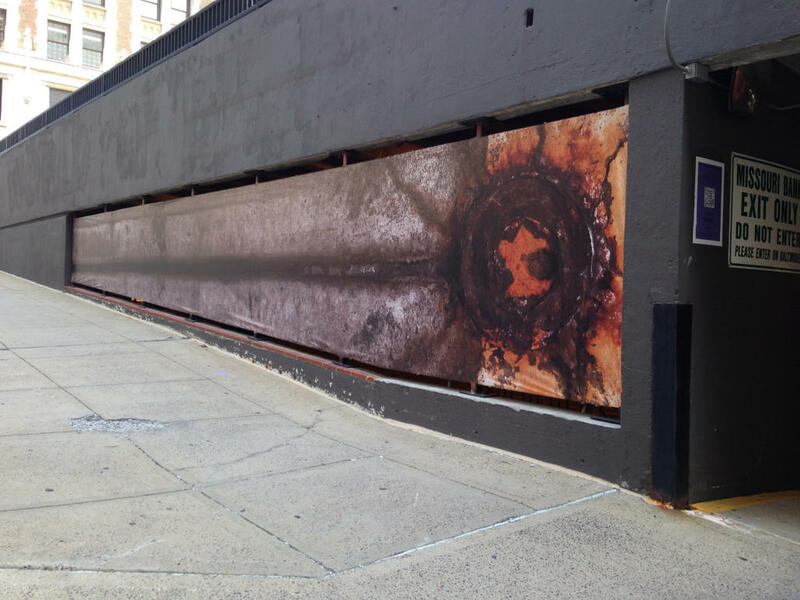 Dan Frueh's 'Down Around the Corner' is a large image of a stretch of downtown sidewalk. For Art in the Loop, Frueh printed a photograph of one of these circles, remnants of the old fence. The work, called "Down Around the Corner," is stretched on vinyl on the Missouri Bank Parking garage at 11th and Main. What was small underfoot now looms large — more than 30 feet long and six feet tall. "In an effort to get people to be more conscious of their environment and take a closer look at things that they walk by every day and may not necessarily notice," he says. Art in the Loop expanded its reach this year to 20 projects, including nine art installations and 11 performances primarily in or around Oppenstein Park. But there's also one at Prairie Logic, on the rooftop at 12th and Main, just north of Cosentino's and another at KCATA Transit Plaza at 10th and Main. "I think this is something that is connected to summertime identity with downtown that people might really look forward to," says curator Jessica Borusky. Not all of the art is up — yet. Look for an LED-lit walkway, an installation by White Art Studios, south of 12th and Walnut and a canopy of plastic bags by Minh DuPha, in Oppenstein Park, later this summer. Art in the Loop performances run through Sept. 3, Thursdays from 11:30 a.m. to 1:30 p.m., Oppenstein Park at 12th and Walnut in downtown Kansas City. Art installations are on display downtown, at various locations, through October. For a full listing of performances and art exhibits, check the Art in the Loop website. After a year of construction, crews have finally completed laying Kansas City's downtown streetcar tracks. 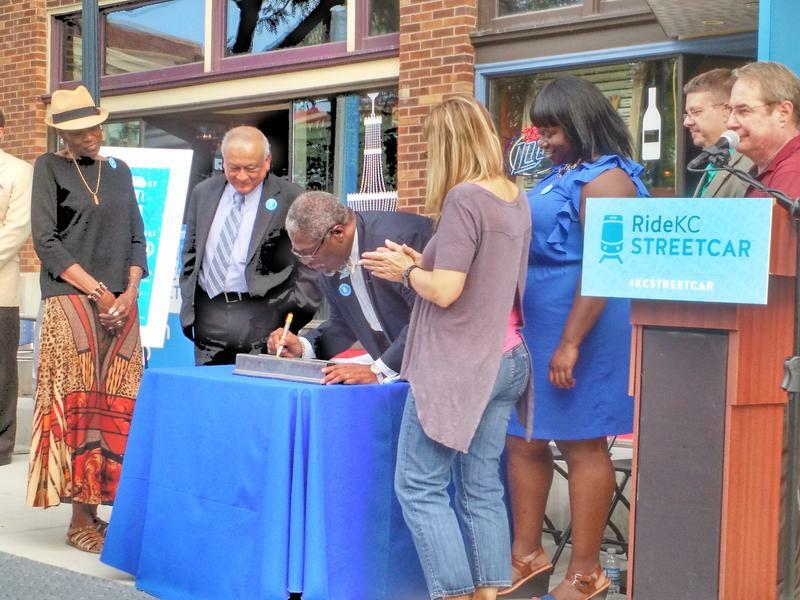 More than 100 people showed up to the project's "River Market Rail Rally" Wednesday, which celebrated the streetcar's progress, as well as new artwork that will be showcased on two other stops in the River Market neighborhood near downtown. 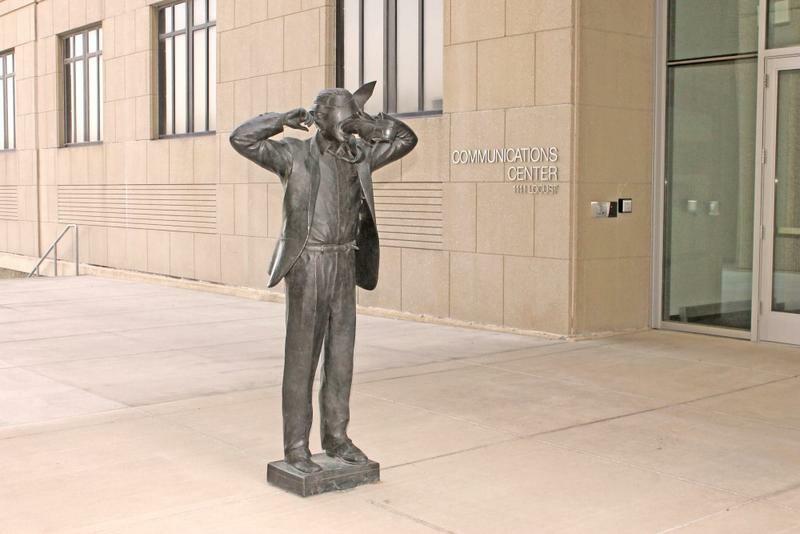 For two decades, the public artwork Modern Communication has caused controversy in front of Kansas city's police and fire department downtown. A bronze businessman stands on a briefcase – he has a shoe in his mouth, fingers in his ears, and a tie flapping across his eyes. In our Beyond Our Borders story on arts and the state line in the Kansas City area, artists and leaders of arts organizations said they believed that the boundary isn't much of a barrier when it comes to the metro's cultural landscape — artists and audiences enthusiastically cross the state line for all sorts of cultural events. The Kansas City Parks & Recreation Department celebrated the opening of Soccer Village on Friday. 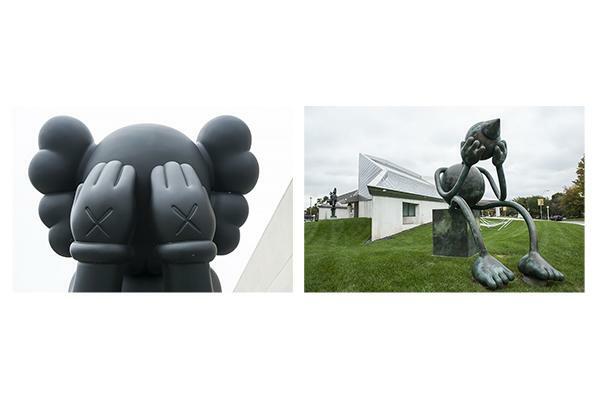 In addition to pristine practice fields with perfect synthetic grass and a natural-grass championship field with grandstands that seat 1,500 people, there’s also a sculpture, thanks to the city’s One Percent for Art Program. The artist, Jake Balcom, installed the work last week with help from two friends, Spencer Schubert, also a local sculptor, and musician Brent Jamison.